A Christmas holiday custom in Ireland is to break nasty political news just before the big day when everyone is too busy to take much notice. Today, news broke of how rejigged legislation will bring in disputed water charges, (a prerequisite of the EU’s ‘bail out’ agreement), through the back door. Here is the article: Almost 100,000 households face being hit with a new water charge from 2019. This begs the question as to why has no one has kicked up an enormous fuss about the potential loss of an important legal EU exemption? A legal protection that is one of the most useful weapons that the water movement has against the pillaging of the water resources of Ireland. This provision allows the Irish public to pay for domestic water services via general taxation as opposed to direct charges. Exemption 9.4 of the Water Framework Directive, was negotiated and renewed by successive Irish governments as part of the River Basin Management Plan. It is due to lapse in two months time and there is a blanket silence over the issue. Neither media, politicians nor activists from any side of the spectrum are discussing it. Without it, Ireland will be liable for hefty fines from the EU for not following the commission’s preferred option of direct payments by individual families to both privatised and publicly owned water companies. The Irish public have made their position clear. They prefer paying for the service via general taxation. Above all they fear and reject privatisation of the resource, feeling that direct charges leave the water resource utterly vulnerable to that fate. They know that privatisation will lead to skyrocketing prices, poor quality control and water poverty. Indeed these are issues that have prompted many European local authorities, at substantial cost, to resume management and ownership of their own water services. Allowing the exemption to lapse certainly suits the neoliberal Fine Gael and Fianna Fail ruling parties, (currently in a ‘confidence and supply’ minority governent arrangement), whose ideological position is one of privatisation of public services. However for politicians from the other side of the house to allow this happen is like handing your biggest cannon to your foe and affording them the means to utterly defeat you. Media commentators will use the resulting EU fines to support the ruling party’s line and crush the grass roots led Anti Water Charges Movement. What options do members of the public who wish to continue paying for their water services via general taxation have? Perhaps the best one is to ask vulnerable Fianna Fail parliamentarians what they are doing to safeguard the exemption? It’s retention is the only legal safeguard our water resource has. The following is an extract from 'The Future of Water Charges' a legal opinion obtained by the Joint Committee on the future Funding of Domestic Water in Ireland February 2017. …..Signed : Matthias Kelly, QC Essex Chambers London WC2A 1DD And Merchants Quay Chambers, 25-26 Merchants Quay Dublin 8. Mr. Kelly’s position is supported by the 9 Irish MEPs in this letter to the Irish Times. "if Ireland would like to avail of Article 9.4 (the derogation) then it should submit that request in its second River Basin Management Plan with justification. This second river basin management plan is now not due to be submitted until 2017, with plenty of time for Ireland to establish that derogation." (An extension of two months has been currently granted to the Irish Government leaving the renewal due in Feb 2018). February 21, 2017, must go down in Irish history as the day the anti water movement was utterly shafted by Right2Water Trade Unions. On that day Steve Fitzpatrick (Communications Workers Union) along with Dave Gibney (Mandate) appeared before the Oireachtas Committee on Funding of Domestic and accepted the principle of water charges for excessive use. Both Fitzpatrick and Gibney were introduced by the Committee chairman as representing Right2Water. After this bombshell some in R2W later argued that Mr Fitzpatrick’s was actually talking about swimming pools and industrial water use, however, the record clearly shows that his answer was indeed in relation to domestic water use. The more I watch the video and read the Oireachtas transcript, the more I am convinced that the presentation was planned. The two union officials seemed to know what was coming. The furtive glances, the nods and demeanour, the nervous tension all lead one to believe that it was a well choreographed drama. Although the charade seems to have done enough to fool a lot of people, however, the fact remains that the official Dáil records show that Right2Water accepted the principle of water charges. The two union officials unilaterally went against a fundamental demand of Ireland's anti water movement, i.e. no water charges. This action, which can only be seen as deliberate led to the outcome of the final Oireachtas Report. Were these two seasoned trade unionists, well versed in the art of collective bargaining, duped by Fianna Fáil? That's hard to believe. Three times they were asked and three time they answered 'yes'. It is difficult to see what purpose the two trade union officials had in attending the Committee session other than to agree with water charges and copper-fastening the Trade Union’s control of the anti water movement. It was emphasised several times by the chairman and by Fianna Fáil's Barry Cowen that Mr Fitzpatrick and Gibney spoke on behalf of the Right2Water movement. The question of how come two union officials came to represent Ireland’s Right2Water is startling. In the first place the fact that they attended the committee session made it official that they were speaking on behalf of the movement. Secondly it set in stone their agreement to an excessive use charge. After that there was no going back. It was all the more remarkable since it was the first time Steve Fitzpatrick played such a key public role in the movement. It’s as if he was brought in to do a job, a job he fulfilled to the letter. The Oireachtas Committee on Future Funding of Domestic Water spent a full day on February 15, 2017 discussing compliance with European Law and the role of the regulator. A major part of that session concerned the principle of Ireland's ' Established Practice' enshrined in Article 9.4 of the Water Framework Directive and whether it is still a valid option for the Irish Government to re-invoke the 9.4 Exemption that would allow Ireland a derogation from charging for domestic water. Two Senior Counsels, invited by FF and SF, were adamant that it was still intact and on that basis saw no reason why the Irish Government should not use it. It was noticeable how vehemently the EU Commission delegation and Fine Gael forcefully argued that Ireland gave up it’s right to invoke the 9.4 Exemption and asserted that it is now defunct. As a result of the convincing arguments of both senior counsels, including supporting evidence of two similar cases in the European Court of Justice (ECJ) and the EU Commissioners and FG efforts to quash it, I anticipated that the 9.4 Exemption would be, not only included but would form a major part in any report or recommendation. However, there was no mention of Established Practice’, ‘9.4 Exemption’ or ‘Derogation’ in any final report, including the the 'Final Confidential Draft Report' that was supported by all the R2W TDs. Incredibly, it was replaced by the new concept of 'Progressive Charges ' for excessive use and all that that entailed e.g. metering. According to the Committee secretary all the TDs on the Committee agreed the contents of that Final Draft Report. Progressive Charges, Metering and 9.4 Exemption. Who Benefits? 1. The concept of charging and a minimum allowance was proposed by Sinn Féin and supported by R2W Unions in 2015 when Lynn Boylan included it in her European Citizen Initiative. This was totally opposite to R2W and even Sinn Féin’s stated policy in Ireland. 2. A small daily allowance and charges for anything above was accepted in the final Oireachtas Water Committee reports. The principle of charging, no matter how small sets a precedent, it commodifies water with a natural consequence of a metering programme. There is no other way to measure a daily allowance. 3. There is now two components necessary for privatisation established, namely charging and metering. The ink is not yet dried on the Oireachtas report and the legislation based on it, the Water Services Bill 2017, now allows the charging amounts and allowances to be manipulated. What with the Irish Water company well established, most of its plants and businesses outsourced to private companies, incentives and legal commitments in relation to metering, there is not much in it for optimism for the future. 4. Retention of Irish Water the company. By accepting the process of the Oireachtas Committee, in the first place, and especially it’s Final Draft Report, the R2W TDs accepted and copper fastened the Irish Water company. In 2016 Eoin O Broin, Sinn Féin accepted that there was no viable alternative to Irish Water. This statement was not contradicted by any in the R2W leadership. 5. By not including the 9.4 Exemption , R2W TDs accepted the arguments from the EU Commissioner. They have now allowed the Government to ignore it in future River Basin Management Plans. During February 15th debate Eoin O Broin unilaterally introduced a brief statement that the 9.4 was not included in the first RBMP. In my opinion this was a highly significant remark, one that I would argue strongly against. It was not the first time that Sinn Féin introduced brief unilateral statements which, in the circumstances, would be seen as R2W policy. Without being corrected by R2W these throwaway remarks have had major consequences for the anti water charge movement in general and they have forced the direction of the anti water movement. 6. R2W Trade Union delegation to the Oireachtas Committee on Feb 16th agreed that a former statement by Brendan Ogle where he stated that he was not opposed to ‘charging for excessive use’, is the policy of R2W. Again this was another unilateral statement by R2W Trade Unions but taken with Lynn Boylan's 2015 Citizen's Initiative, it was designed to copper-fasten the policy of an excessive use charge again forcing the direction of R2W movement. 7. Having not included the principles contained in the 9.4 Exemption in the Oireachtas Committee's final report, the ball was left firmly in Government hands whether they might re-invoke it or not. How much pressure Fianna Fáil will exert to have it re-invoked or how much commitment they have to the 9.4 Exemption is anyone's guess. In my opinion this has been a massive failure of the R2W TDs. Their argument that they were only 5 TDs in a committee of 20 is not good enough. As I have said previous they either did a deal (which they are not willing to explain) or else they have been outwitted by their counterparts. In the first place R2W should not have taken part in the establishment's charades and secondly when and if they realised that the 9.4 was not in the running they should have walked out and called an uprising. Prior to and after the February 15th Oireachtas session, the 9.4 Exemption was seen as one of the most effective defences against EU insistence that Ireland charge for domestic water. To my dismay this exemption was thrown away by the R2W TDs and Fianna Fáil on the committee when it was not included in the final report. For seven months all requests for an explanation from R2W and R2W TD's have been met with a wall of deafening silence. Further research showed that between the 9.4 discussion in the Oireachtas Committee on Feb 15 and publishing its draft report on the April 5th the committee met in over 30 secret sessions. Attempts, through direct requests to the department itself and R2W and through the Freedom of Information process , to get details of the discussions in those private sessions have been refused. It is obvious something substantial must have transpired to convince the R2W TD's and Fianna Fáil to abandon the 9.4 Exemption and accept excessive charges and metering instead. Either they succumbed to FG and Eu pressure or some type of deal was done. Without complete information or openness and transparency and through lack of democratic avenues within R2W, I am convinced that the latter is the most likely. 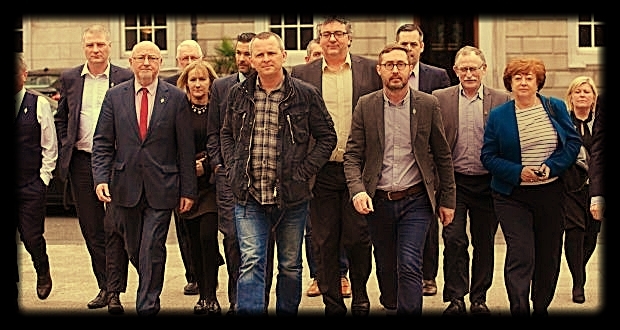 Until I get reasonable answers the facts and silence is pointing to FF and the R2W TD's dropping their support for the 9.4 and accepting Progressive Charges in it's place, a complete U-Turn from the positions that they portrayed in the media and manifestos. They abandoned one of Ireland's best defences against European bureaucracy and allowed Brussels an inroad to do away with Ireland invoking the Water Framework Directive’s 9.4 Irish Exemption, something that the Commission has been planning for some time. Now the defenders of the Oireachtas Committee are practising how best to hoodwink' their various supporters and the public in general and hopefully not get found out. As part of this propaganda the R2W TDs banded together on the morning of April 6th, after the introduction of the final Draft Report when over twenty of the biggest bunch of sell-out TDs marched up to the Dáil media plinth and spouted forth their betrayal of the 9.4 Exemption, the Anti Water Charges Campaign and the people of Ireland. Fianna Fáil have been no different. They once professed strong anti water charges and anti Irish Water principles but have conspired with Fine Gael, contrary to the mandate they were given by their supporters, to establish Irish Water and through their agreed mechanisms with Fine Gael to defuse the massive anti water movement and finally to introduce water charges and metering. Barry Cowen, FF, MacGill Summer School, July 2015, "The botched implementation of the water charges regime by the government has shook public trust in the tariff system. Fianna Fáil maintains its call for the immediate suspension of charges. Domestic charges should only be introduced when the national infrastructure is brought up to standard."